The ideal solution for those who want to have maximum preservation quality of fruit and vegetables and at the same time maximum operational flexibility. Isolcell’s PAL-STORE system handles the storage of pallets of fruit and vegetables in independent controlled atmospheres, maintaining the O2 and CO2 concentrations that are ideal for different pallets of product; when the time comes to sell the products it is possible to disconnect from the system the quantity of goods needed without interfering with the values of the atmospheres of the other pallets being stored. The PAL-STORE system is particularly suitable for storing small fruit and all the fruit and vegetables whose sales quantities are such that a high degree of flexibility is needed in the management of storage atmospheres. The PAL-STORE system consists of special high-strength transparent enclosures within which the pallets of fruit and vegetables are stored. A precision analysis and computerized management system checks the values of O2 and CO2 inside transparent polyethylene enclosures, guaranteeing both that specific values are maintained for each pallet, and the consistency within each individual pallet. The PAL-STORE system is modular and can handle a potentially infinite number of pallets, ensuring that the various atmospheres are maintained in case of disconnection of individual enclosures. 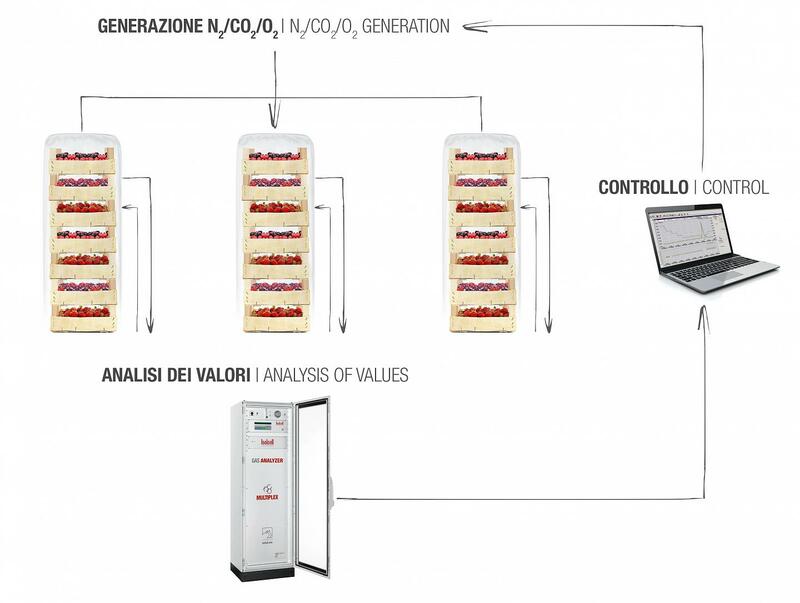 As optional equipment to increase the quality of stored products the PALCLEAN(r) system can be used, patented by Isolcell, which eliminates spores and odors and therefore ensures an unequaled quality of the stored product.